What a ride! Roaming spotlights playing over audience and stage at the start of the show suggested we were in for something big! Looking positively glamorous in gold, UK’s Frisky & Mannish enter the stage to form a beautiful tableau, and that was about their only serious moment. Everything about this show is over the top. I’m tempted to tag them the greatest hams in the history of show business. But this is a good thing. Promoting themselves as a bridge between pop and cabaret they set about demolishing everything you may hold dear about either genre in a fast paced, tightly scripted and hilarious send up of a long list of songs and their performers. We learn that most pop singers (except for Katy Perry and her paean to plastic bags) don’t write their own material, and in fact 81% of all popular songs are written by The Bee Gees! We learn, too, that Sinead O’Connor wrote way more letters of advice than just the famous one to Miley Cyrus. There are so many really funny moments. A medley of songs revised for the Internet age inserts Google, Tweets and Facebook into the lyrics of famous songs; “I Still Haven’t Found What I’m Googling For” [U2]. A collection of Australian songs reveals their take on the Australian psyche, and a fast and furious trawl through candidates for a feminist anthem is priceless. And just in case you might think they take themselves seriously, once they’ve finished taking aim at everyone else they turn the blowtorch on themselves. This superb dismantling of popular culture is all done via bits of well-known songs with altered lyrics, and some of the funniest singing I’ve ever heard. They can make the most beautiful song sound ridiculous, and the most inane pieces sound like works of high art. Outstanding performers; great writers. They try towards the end to take things seriously again for a minute but it lasts about 30 seconds before their wonderfully weird and demonic selves resume control. They close with a love song to us and all humanity but we know they don’t believe a word of it! Sensational! 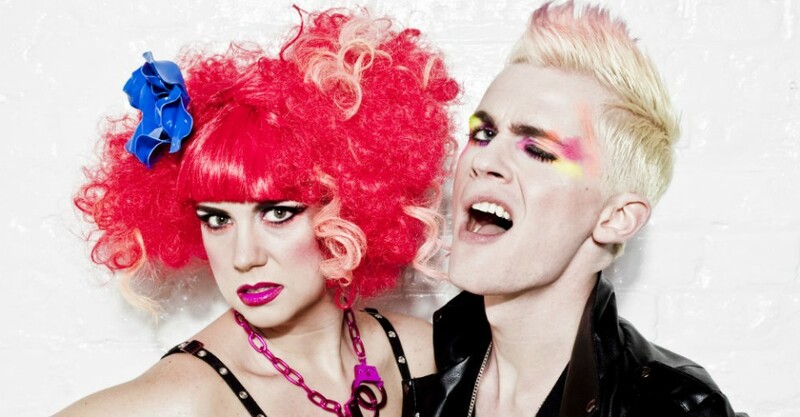 Frisky & Mannish continues at Festival Theatre Stage, Adelaide Festival Centre, from 9pm until Fri 12 Jun. Festival Theatre Stage, Thu 11 Jun What a ride! Roaming spotlights playing over audience and stage at the start of the show suggested we were in for something big! Looking positively glamorous in gold, UK's Frisky & Mannish enter the stage to form a beautiful tableau, and that was about their only serious moment. Everything about this show is over the top. I’m tempted to tag them the greatest hams in the history of show business. But this is a good thing. Promoting themselves as a bridge between pop and cabaret they set about demolishing everything you may hold dear about either genre in a fast paced, tightly scripted and hilarious send up of a long list of songs and their performers. We learn that most pop singers (except for Katy Perry and her paean to plastic bags) don’t write their own material, and in fact 81% of all popular songs are written by The Bee Gees! We learn, too, that Sinead O’Connor wrote way more letters of advice than just the famous one to Miley Cyrus. There are so many really funny moments. A medley of songs revised for the Internet age inserts Google, Tweets and Facebook into the lyrics of famous songs; “I Still Haven’t Found What I’m Googling For” [U2]. A collection of Australian songs reveals their take on the Australian psyche, and a fast and furious trawl through candidates for a feminist anthem is priceless. And just in case you might think they take themselves seriously, once they’ve finished taking aim at everyone else they turn the blowtorch on themselves. This superb dismantling of popular culture is all done via bits of well-known songs with altered lyrics, and some of the funniest singing I’ve ever heard. They can make the most beautiful song sound ridiculous, and the most inane pieces sound like works of high art. Outstanding performers; great writers. They try towards the end to take things seriously again for a minute but it lasts about 30 seconds before their wonderfully weird and demonic selves resume control. They close with a love song to us and all humanity but we know they don’t believe a word of it! Sensational! Michael Coghlan Frisky & Mannish continues at Festival Theatre Stage, Adelaide Festival Centre, from 9pm until Fri 12 Jun. Book at BASS on 131 246 and bass.net.au. Click HERE to purchase your tickets.